The Riverside Water Tower (1870), the symbolic centerpiece of Riverside, was recently restored and now provides a venue for the Riverside Museum to display exhibits on local history. Riverside, Illinois, (population 8,995) was incorporated in 1875 and is located 11 miles outside the city of Chicago. Renowned landscape architect Frederick Law Olmstead designed Riverside, seeking to feature green space and the topographical features of the Des Plaines River. Many original features of Olmstead's design are still intact, including the curvilinear streets, expansive green parkways, and gas-lit street lanterns. The development of Riverside is seen as one of the most successful rail-oriented developments, and the entire village was designated a National Historic Landmark in 1970. The Riverside Water Tower, the symbolic centerpiece of Riverside, recently received a dramatic restoration of the tower and its outbuildings. 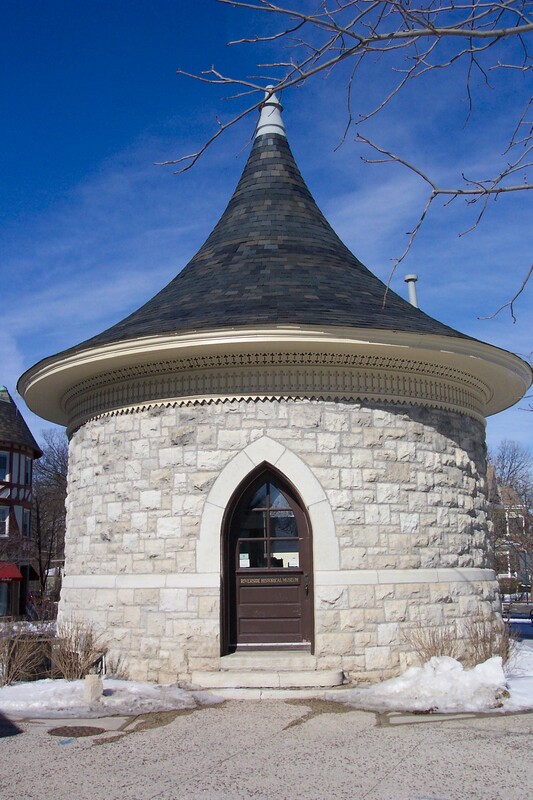 The original water tower was designed by William Le Baron Jenney in the Victorian Gothic style and was constructed in 1870. The water tower remained fully functional until 2005, when it was decommissioned. In 2001 the Historical Commission and Board of Trustees engaged the community in discussions about the restoration and the future use of the water tower. A Save America's Treasures Grant, local contributors, and the village of Riverside funded the $1.4 million project. Completed in 2006, the restored water tower now provides a venue for the Riverside Museum to display exhibits on Riverside history. One of the main responsibilities of the Riverside Historical Commission is to operate the Riverside Museum. Volunteers assist in the operation of the museum, sifting through archives and working to staff the museum when it is open to the public. The Riverside Museum allows visitors to view local history records, historical documents, and photographs that document the evolution of the village. A virtual tour of the many historic structures in Riverside is located on the Riverside Museum's Web site. The interactive Web site features a map with links to each individual structure. Information about each structure includes an address, date built, architect (if available), architectural style, and a statement of significance. Information about when the structure was designated a landmark is also included.